The concept of “workplace” in many sectors does not mean a tall office building, but a location that is changed multiple times a day. Numerous jobs require the employees daily to move around in the city to carry out tasks – examples of these are the plumbing, security, elderly care and cleaning sectors. The employer in these sectors has to rely on old-fashioned and lagging methods in ensuring that all his employees are safe during the day, the different tasks get done in time, and that the time log is filled in correctly. How could you digitize some of these features through an automatic check-in at workplace? This is a case study of one company called Alppilan Kiinteistöhuolto that operates in the building maintenance field. The case study walks through both the driving problem for this solution, the end result, and the setup required for achieving this. Alppilan Kiinteistöhuolto had encountered a problem about keeping up-to-date with their employees’ whereabouts and the tasks carried out by them. 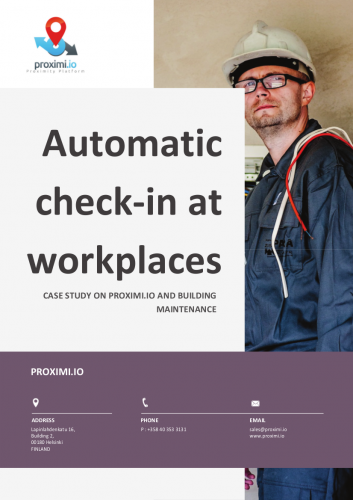 A combination of beacons, GPS location, Proximi.io proximity platform and a tailored employee application were utilized in automating the task-management process.